The first attempt by Westland to develop a monoplane fighter evolved from a private venture prototype designed - by the company's draughtsmen in their spare time - during 1926 with high speed performance the primary objective. Known simply as the Racer, this unarmed parasol monoplane of mixed construction was powered by a 275hp Rolls Royce Falcon III inline engine and flew in November 1926. Badly damaged in a forced landing in 1927, the Racer was rebuilt in much modified form as the Wizard fighter. In this form, it was primarily of metal construction and had a 490hp unsupercharged Rolls-Royce F.XI 12-cylinder Vee-type water:cooled engine in a more streamlined nose cowling, with a retractable radiator in the underside of the fuselage. The Wizard - which was flying by late 1927 - used a similar parasol wing to that of the Racer, this being mounted close to the fuselage on tandem pylons on the fuselage centreline. Two 7.7mm Vickers guns were mounted semi-externally in the fuselage sides. The Wizard's performance, and particularly its rate of climb, attracted a modicum of Air Ministry interest and a contract to cover testing at Martlesham Heath. There, the pilot's forward view was found unsatisfactory, leading Westland to design and fit a new wing with changed planform outboard, new inset ailerons and a thinner centre section, mounted on more conventional cabane strutting. A supercharged 500hp Kestrel II (F.XIS) was fitted, but in this final form, the Wizard II, as it was sometimes known, demonstrated a reduced performance and failed to persuade the Air Ministry to change its policy towards monoplane fighters. It was a rarity of British aviation - a parasol monoplane. Ref: "...biplane-minded Air Ministry powers...."
Remember, WW1 ended only nine years prior and I am willing to bet that most of those Top Brass were WW1 RFC pilots, with no knowlege of aeronautical engineering, still carrying walking canes and wearing jodphurs and spurs. The concept of the wings staying on a monoplanes was beyond them. That is what killed the Bristol M1C. Remember...they also were looking for performance...and the revised design fell shorter than its original. Sidney Camm of Hawker got it right...when the Fury engineering eventually became the Huricane. I was born when they still wore jodphurs, by the way! Most between the wars fighters were biplanes but this is just that bit different and well worth modeling. Best of luck. To the three comments above gentleman this is indeed a very appealing aircraft. I am a radio control modeller myself so to Bob there is a good plan available from Traplet Publications Ltd In the UK at 80 inch span this will give a scale of 1:6.075 and can if you wish be enlarged at any plan printing shop. Check the web www.trapletshop.com/plans. This is what happens when Westland's designers are given free-hand to beautify their Widgeon concept. It sure is a pretty plane! It was especially courageous of Westland to submit a parasol monoplane after the Air Ministry's attitude towards another very decent monoplane, the WW1 Bristol M1. 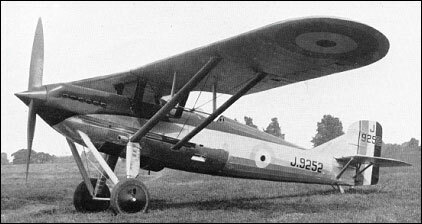 But, the addition of a sesquiplane arrangement, a la Vickers-Armstrong, may have made it more acceptable to biplane-minded Air Ministry powers-to-be. Agreeing with both Neil and Bob, what an R/C model it would make! Must agree with Bob, what a fantastic looking subject for an r/c model. Most between the wars fighters were biplanes but this is just that bit different and well worth modeling. Best of luck. A wonderful looking aircraft, but no surprise the ministry said no to it. Is there an example still in existance or at least a more detailed study of it published somewhere? I am about to model the aircraft in 1/5th scale for radio control and could do with as much detail as possible for obvious reasons. Any help in this would be very much appreciated.